With the release of Star Wars: Episode I–The Phantom Menace, Decipher introduced a new Collectible Card Game, Young Jedi. The first expansion, containing 140 cards, was Menace of Darth Maul. 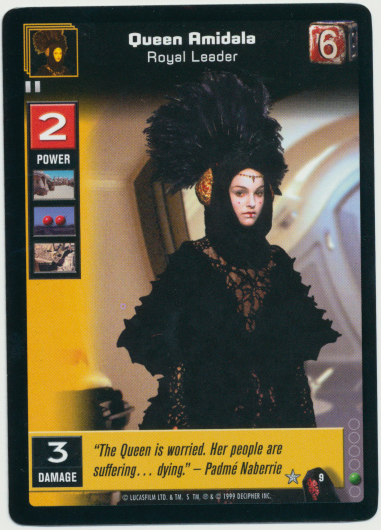 Queen Amidala, Royal Leader is the third of three character cards in this expansion of the Queen of Naboo. Of course, the Queen is not pictured on this card, but rather her decoy, Sabé. I never played the game, so I can’t explain any of the numbers or graphics.